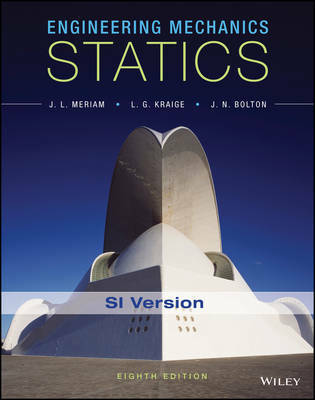 Known for its accuracy, clarity, and dependability, Meriam, Kraige, and Bolton's Engineering Mechanics: Statics, 8th Edition has provided a solid foundation of mechanics principles for more than 60 years. This text continues to help students develop their problem-solving skills with an extensive variety of engaging problems related to engineering design. In addition to new homework problems, the text includes a number of helpful sample problems. To help students build necessary visualization and problem-solving skills, the text strongly emphasizes drawing free-body diagrams, one of the most important skills needed to solve mechanics problems.